Today’s featured song on the GMC Special Feature known as Fantastic Foursome is another with a strong connection to Fred Astaire. For a guy who always comes to mind first and foremost as a dancer, he had quite an impact in many other ways during his long career. In this case, he not only introduced the song in a memorable movie but also had a #1 hit record with it. 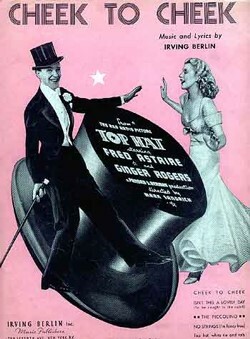 Irving Berlin wrote “Cheek to Cheek” for 1935’s Top Hat, one of Fred and Ginger’s best-known films. The song was nominated for an Academy Award, but lost the Oscar to “Lullaby of Broadway.” However, Astaire’s record of “Cheek To Cheek” climbed to the top of the music charts and stayed at the #1 spot for five weeks, and — in spite of missing out on the Oscar — would eventually land at the #15 spot on the AFI list of most memorable movie songs. And just for good measure, it would also eventually be inducted into the Grammy Hall of Fame. Of course, as the years passed the song was recorded by just about everybody, and some of the best are below. You can listen to each and then — if you like — vote for your favorite in the poll below the video.